In a 40 minute speech opening, the September G20 Summit in Hangzhou, Chinese President Xi Jinping outlined a global vision so comprehensive and detailed that it was tantamount to a blueprint for restructuring and transforming the currently unbalanced architecture of the world economy, and replacing it with a more stable model, enhancing economic and social justice. The blueprint advocated by China’s President would end the dominance of predatory Western Capitalist economies predicated on the plunder of the developing world, and exploitation of the rich natural resources of Africa, Asia and Latin America. This plunder has fueled and sustained the monopolization of global wealth by a narcissistic and miniscule minority of .01 percent of the world’s population, while condemning the vast 99% majority of the world’s population to the doom inflicted by the Four Horsemen of the Apocalypse: conquest, war, famine and pestilence. Xi Jinping’s inclusion, as guests, of the Heads of State of formerly excluded developing countries at the G20 Hangzhou Summit provided, for the first time, the opportunity for the voices of these countries to be heard and heeded, and a new model for the G20, as China’s presidency encourages the G20 to “meet the demands of people in all countries,” by innovation of development models building an open world economy. He asserted the imperative that the world’s Gini coefficient, which measures inequality currently at 0.7, (exceeding the already acknowledged and alarming level of 0.6,) must be taken seriously as evidence that the currently dangerous economic structural imbalance threatens already fragile and deteriorating global stability. This perilously unbalanced economic order, if uncorrected, lurches toward the devastating tipping point of uncontrollable global economic and social crisis, with resultant chaos and uncontainable violence spreading throughout the world. What Xi Jinping proposes appears to be no less than a profound restructuring of the global economic architecture, transforming it into one that redresses grievances of the overwhelming majorities of the populations of the developing world, and promotes industrialization of huge swaths of developing countries currently dependent on “monocrops,” or whose economies are dependent upon one resource, such as oil, condemning these unbalanced and underdeveloped economies to dependency and victimization as the price of these monoproducts fluctuates, often by geopolitically motivated external manipulation, with the standard of living of these dependent and too often victimized populations rising or collapsing accordingly. The speed of China’s growth is exponential and should most probably be attributed to its socialist economic model, “with Chinese characteristics,” which is fully compatible with rapidly achieving the United Nations 2030 Sustainable Development goals, a United Nations agenda which bears striking similarity to the economic and social goals of socialism. Although there are areas of serious inequality within China, and still impoverished places within the country, the Chinese government is aware of the vulnerability and risk that this inequality presents, and is addressing the need to eliminate poverty within China, with notable success. This is in stark contrast with large areas of the so-called “developed world,” where austerity measures within Europe, and the dismantling of the New Deal social protections within the USA is eroding the middle class, exponentially increasing inequality, and destabilizing societies within these capitalist economies. This is resulting in rampant and increasing violence and debased standards of education and health care, reducing these capitalist enclaves to the level of Third World countries, as they unravel and slouch toward underdevelopment, and a form of internal colonization of impoverished majorities controlled by Wall Street. It is possible that the participating leaders of “developed” capitalist countries in attendance at the G20 Summit in Hangzhou, hearing President Xi Jinping’s speech, might, instead of heeding his wise prescription for win-win transformation of the global economy, could, instead, react with alarm, and reject his blueprint for a stabilizing global economic and socially equitable architecture and governance, regarding it as a threat to their centuries-long dominance of the global economic, social and military order, which benefited the tiny minority which monopolized the profits of that zero-sum order. Such an adverse reaction to Xi Jinping’s speech at Hangzhou might lead to an escalation of confrontation, in an attempt to thwart, and ultimately cripple China’s breathtaking ascendance, which contrasts so vividly with the capitalist unipolar dominance of the world, which recently culminated, disastrously, in the global economic crisis of 2008. The US-ROK supported THAAD missile system threatens to destabilize both China and Russia, essentially completing the encirclement of Russia, surrounded by NATO bases in the West, and now threatened by THAAD in the East. Interestingly, however, the US military and political efforts to encircle and “contain” China seem to be effectively countered by China’s recent visits to Canada and Cuba, which cemented economic and political bonds with these close neighbors of the USA, and, perhaps inadvertently constitute a reciprocal “encirclement” of the United States. It was significant that the grossly increased investment in advanced nuclear weapons by the USA and the UK was not discussed publicly at the G20 in Hangzhou. 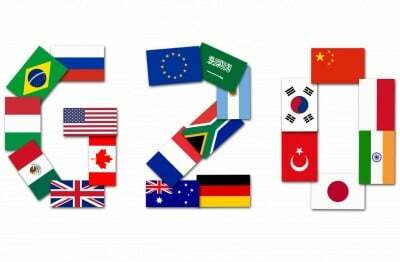 Regardless of the focus of the Summit on investment in development and cooperation, the discrepancy with the countervailing investments by some G20 participants in the instruments of global destruction, however profitable, should have been of central concern. Ignoring this discrepancy forfeits a great opportunity, and merely postpones the inevitable day of reckoning.